THURSDAY, Jan. 18, 2018 (HealthDay News) — In an early step toward “one-stop” screening for cancer, researchers report they’ve developed a blood test that can detect eight types of the disease. The blood test is dubbed CancerSEEK. It was able to catch cancer cases anywhere from 33 percent to 98 percent of the time, depending on the type. The accuracy range was better — 69 percent to 98 percent — when it came to five cancers that currently have no widely used screening test, the scientists reported in a new study. Those cancers included ovarian, pancreatic, stomach, liver and esophageal cancers. The researchers said the findings are an “exciting” initial step. The hope is to eventually have a single blood test that can screen people for a range of common cancers. In recent years, researchers have been studying “liquid biopsies” — tests that look for cancer markers in the blood or other body fluids. Those markers can include, for instance, mutated genes or abnormal proteins shed from tumors. But it can be like looking for “less than a needle” in a haystack, said Dr. Len Lichtenfeld, deputy chief medical officer for the American Cancer Society. So far, liquid biopsies have mostly been tested in patients with advanced cancer. Early stage cancers shed fewer markers. “You have to detect smaller and smaller molecules that are swimming in a sea of background noise,” Lichtenfeld said. CancerSEEK is different because it combines tests that look for 16 genes and 10 proteins linked to cancer, explained Lennon, of Johns Hopkins Kimmel Cancer Center in Baltimore. “That’s a big move forward,” she said. This test also tries to tackle a limitation of other liquid biopsies: namely, that they can suggest cancer is present, but can’t show where. The CancerSEEK test uses a computer algorithm to try to pinpoint the organ, or at least narrow it to a couple of possibilities. But much work remains. “This is not ready for routine clinical use,” Lennon said. For one, the current study did not look at whether CancerSEEK can actually screen for tumors. Its accuracy was tested in patients already diagnosed with cancer. Screening, by definition, means testing apparently healthy people for early signs of cancer, before symptoms arise. “We still need to study this prospectively in people who aren’t known to have cancer,” Lennon said. The findings are published in the Jan. 19 issue of Science. They’re based on 1,005 patients who had any of eight cancers: breast, colon, lung, ovarian, pancreatic, stomach, liver or esophageal. Most had stage 2 or 3 cancer, which generally means the tumor is growing and may be spreading into nearby tissue. Twenty percent had smaller, stage 1 tumors. Overall, the blood test typically detected 70 percent of cases, though the accuracy varied depending on the cancer. It spotted only 33 percent of breast cancers, but caught 98 percent of ovarian cancers — a particularly lethal disease. And it was better at detecting stage 2 or 3 cancers, versus stage 1, the investigators found. The researchers also tested blood samples from 812 healthy people, to see how often the test gave “false-positive” results. That happened less than 1 percent of the time. That’s promising, Lennon said, because for any test to be useful for screening, its false-positive rate has to be low. 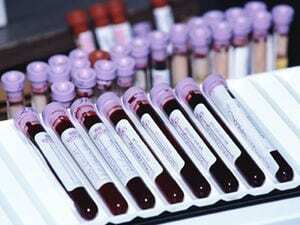 As for cost, the researchers estimate the blood test could run less than $500 — comparable to a colonoscopy to screen for colon cancer, Lennon noted. Ultimately, Lichtenfeld said, the big question will be: Does this kind of testing save people’s lives? “Just because we’re able to detect a protein, that doesn’t mean we’ll save everyone’s life,” he noted. Still, he said he’s “hopeful” that this or similar tests will eventually offer a way to catch particularly deadly cancers, such as ovarian and pancreatic tumors, earlier. The study was funded by grants from foundations and the U.S. National Institutes of Health. Lennon and several co-researchers are inventors on patents or patent applications covering technology used in the study. The U.S. National Cancer Institute has more on liquid biopsies.